I could barely get through this episode. This show is just so all over the place with character motivations/development, plot motion (or lack thereof). 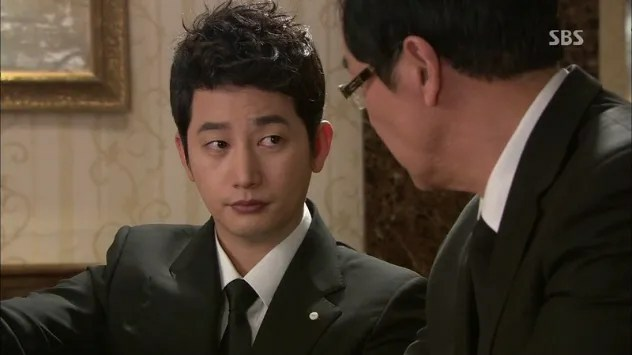 At least uri Park Shi-hoo is adorable. 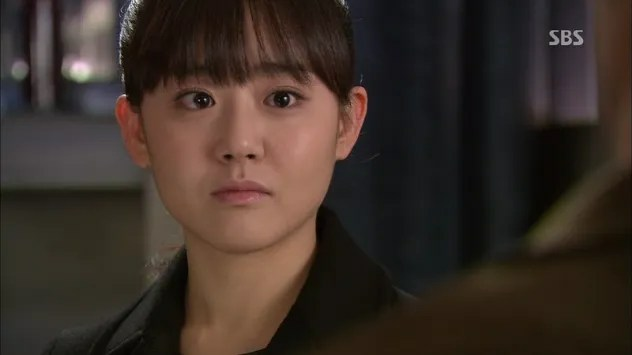 Moon Geun-young also looks really pretty with her hair in a ponytail and the change in make-up. Her eyeliner isn’t as thick. We left off with a declaration of marriage and some very shocked and angry Se-kyung anti-fans. Psycho-jo asks them to take care of Se-kyung at GN Fashion and then Daddy Cha takes them into a room to yell. 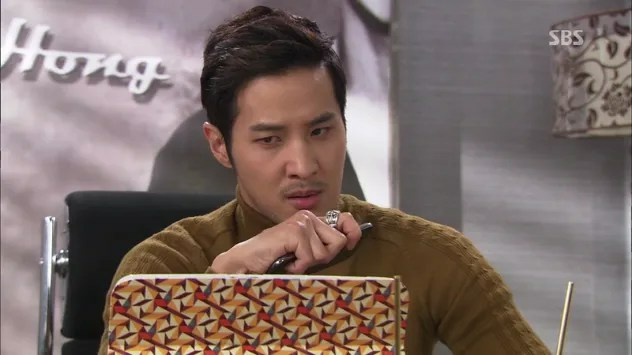 He is pissed that Psycho-jo is using marriage for revenge, but Psycho-jo declares that he loves Se-kyung and this isn’t revenge. Baby, I don’t care how you spin it, but showing off your girl to the father you’ve been competing with is not a good thing. Psycho-jo came to the bazaar to declare his love publicly to dispel rumors of his marriage. In another room, Mama Shin, In-hwa and Min-hyuk are laying into Tommy. They thought they didn’t have to worry about Se-kyung. Min-hyuk is furious that they are humiliated by a part-timer at their own company. In-hwa tells them to stop because the arguing is making her lose face more. Besides, she has lost interest in Psycho-jo who doesn’t realize the importance of a marriage arrangement. 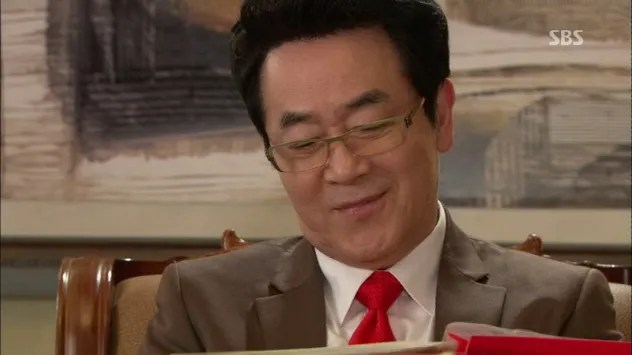 Daddy Cha thinks that Psycho-jo doesn’t really love Se-kyung. Rather he just wants to annoy him. Once daddy acknowledges her, she will be dropped. Psycho-jo is furious and tells her to wait outside. When she doesn’t budge, he drags her outside and goes back in, leaving her to listen to them argue. In-hwa comes out of the room next door and congratulates her. Things like this happen in “her world” all the time. Then, nose in the air, she leaves Se-kyung to listen to the people in both rooms fighting over the situation. She kneels and realizes what entering Cheongdam-dong is for a person like her. Psycho-jo accuses his father of pushing up the marriage after finding out Coach Tick was GN Fashion’s daughter-in-law. He wants to make Psycho-jo yield. Daddy Cha agrees – that’s his wish in life. Psycho-jo hasn’t followed daddy’s wishes at all, but because of that, he says, he has been able to breathe. They declare that nothing good will ever come between them. I want them to make-up. WAH! In the room next door, Min-hyuk is still laying into a humiliated Tommy Hong. He was suspicious ever since Tommy wagered everything in his life for the “business deal.” (I think he meals the Olympic sponsorship.) Min-hyuk tells him he’s not a designer, but a matchmaker, who puts his life on the line with every match. This is why people say not to trust people with murky backgrounds. Min-hyuk tells Se-kyung she can quit her job now as Psycho-jo’s fiancee and Mama Shin is just disgusted by Se-kyung’s low status. Tommy is about to tell her exactly what he thinks when Psycho-jo walks out. He tells Tommy to back off and drags Se-kyung off. Tommy goes back to his office and fumes. The investigator comes with information about Se-kyung meeting with Coach Tick. He video recorded the meeting and when Tommy sees who it is, he’s shocked. 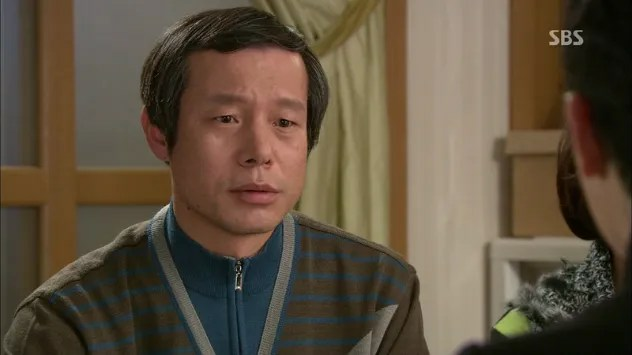 Psycho-jo has taken Se-kyung to a hotel and explains that when he was ten, his mom divorced his dad and left. It was then that he began to feel stifled by his father. One day his mom took him from school, spent a few days with him and returned him home, never to see him again. She did it for the alimony, so she could quote her price. His father then said, “If someone loves you, don’t believe it. That means she will only use you.” He can’t hear “I love you” because his heart clenches and he wonders if it’s real. 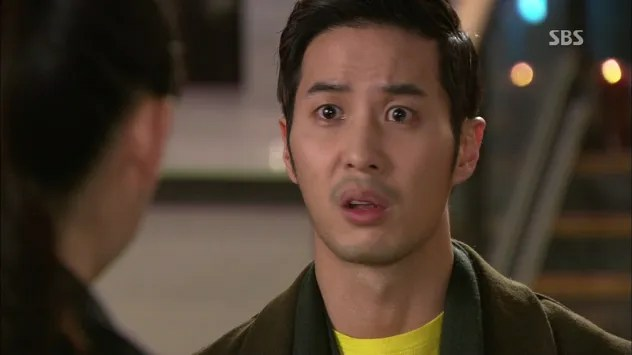 Se-kyung begins to cry as he explains that he constantly doubts and feels anxious. But then one day someone said that the opposite of “I love you” is “there is nothing else I can do for you.” Psycho-jo approaches her with a ring saying there is love that isn’t scary in this world and she showed him that. He asks her to marry him and I can only imagine how guilty she is feeling. There is a long moment shared between them and then Tommy Hong calls. She runs to the bathroom with her phone and leaves Psycho-jo hanging. Tommy has sent her the video of the discussion between her and Coach Tick. Then he video calls her and tells her she’s dead. She has two options: Paris or hell. She has to come to him tomorrow or she’s finished. Se-kyung crumbles to the floor, crying as Psycho-jo begins to speak outside the bathroom door. He realizes things came suddenly for her. He’s not good at pushing things onto other people. Even Paris was to escape his father. He always wanted to live in his own home where he could come home to someone who would ask about his day. If he found this home, he’d be happy. But he couldn’t find such a place and thought it didn’t exist. Until he found her – she is his home. Wow, he just keeps making the truth harder to divulge. She should’ve told him ages ago. Psycho-jo will wait for her because he knows this is all sudden. She dries her tears and emerges from the bathroom. She asks him to tell her he will die if she disappears from his life. He looks really surprised by this, as am I. It doesn’t matter if it’s a lie, she says. He just needs to say it. He tells her he’ll die if she disappears from his sight. Then she holds out her hand for him to put the ring onto. Wow, how is this story making sense? I feel all squicky about this romance. 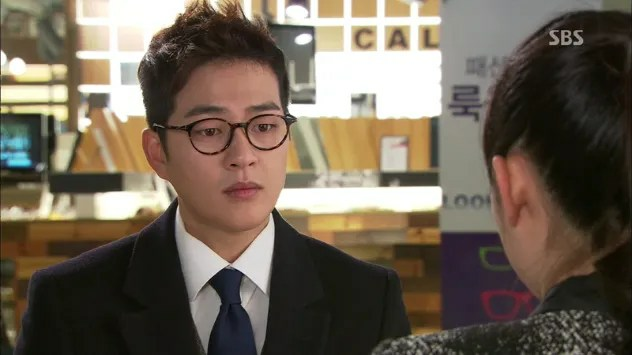 I miss the honesty of a relationship like Kim Boong-do’s and Choi Hee-jin’s in Queen In-hyun’s Man. This show’s relationship is twisted in a way I really dislike. Se-kyung promises to never leave him. If he runs, she will find him. If he tells her to leave, she’ll stay by him. How are these promises valid when they’re built on a shoddy foundation? Tommy Hong is uber pissed and throws things. His secretary supports him even when he accuses her of judging him for stooping so low to blackmail people with videos. Wow, you have issues, dude. From the first moment he met Se-kyung, things have not been pleasant. She reminds him of himself, how he was stepped on by people. He was stepped on like her and now he’s doing the stepping. His secretary assures him it’s better to be quashing people than be quashed. Min-hyuk tells Coach Tick about everything that’s happened. He asks if there is anything she knows because Se-kyung is her friend. She denies any knowledge. In-hwa abandoned the marriage. When Coach Tick leaves, she runs into In-hwa in the hall and says she didn’t know about Se-kyung and Psycho-jo either. The whole situation will pass quickly, so In-hwa shouldn’t fret. In-hwa stops her to ask about Se-kyung. Then she goes to her office to brood. She doesn’t understand the match at all and Coach Tick says she doesn’t either. Coach Tick says Jean Thierry Cha (Psycho-jo) is weird and has a few rumors floating around. In-hwa wonders if Coach Tick is relieved that In-hwa isn’t getting married. Coach Tick smiles too broadly and denies it. She remembers Psycho-jo bringing her the bracelet as a gift at the first dinner meeting and is all suspicious-like. Well, I guess we finally get why In-hwa is in the story – to make Se-kyung’s life more of a living hell. In the car, Coach Tick gets a call from Se-kyung and demands to know what happened. Se-kyung asks to meet and they meet at the playground. Coach Tick watches the video in horror. 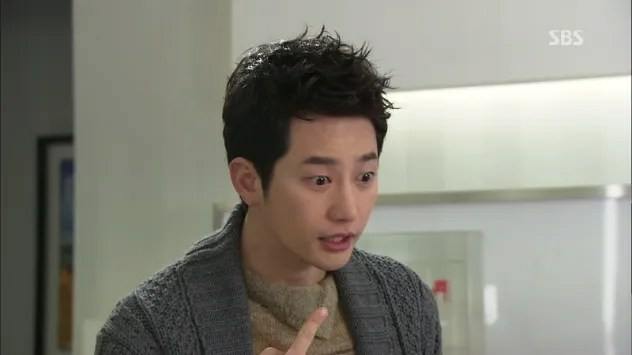 She demands to know how it happened and Se-kyung explains that Tommy had her followed to try and stop her from interfering with the marriage match. Coach Tick thinks they’re all dead. Se-kyung says he gave her two paths: Paris or hell. Coach Tick says that they’re already there. Girls like them always go to hell. Se-kyung tells her that she brought this upon herself. If love came first, why did she give up? She degraded herself and her love and turned into a gold digger. That’s why she’s always caught in these situations. Coach Tick always told her not to be a coward and now Se-kyung is telling her. People like them are always doubted. If they doubt themselves, then they really are nothing. Se-kyung won’t be like Coach Tick. She will enter Cheongdam-dong with her self-worth and love in tact. Psycho-jo re-enacts what happened for Dong-wook who is surprised. He wants to know what Daddy Cha said, which was that Psycho-jo is rebelling against him. Psycho-jo doesn’t get why his dad thinks that, but we all see it. 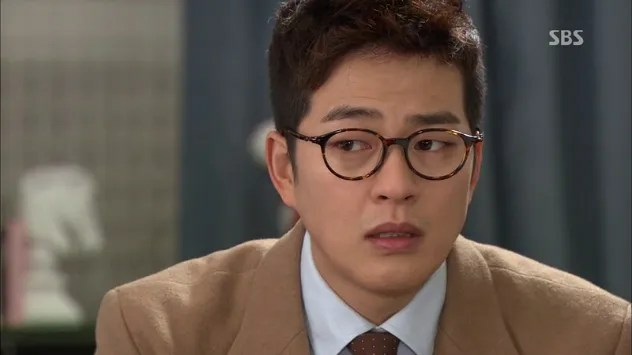 Dong-wook asks why he told his father the news in that manner instead of going to him formally. 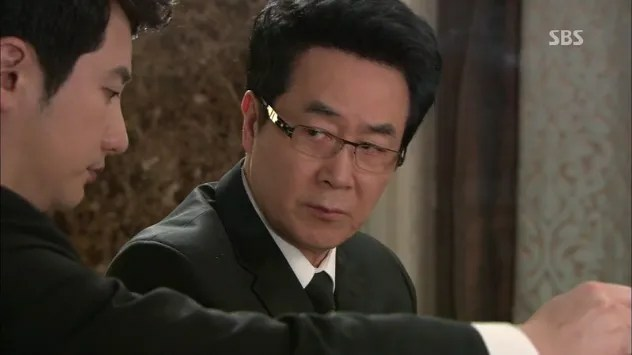 Was he afraid that his father would object if he introduced Se-kyung to him formally? Is that why he created an uproar? Dong-wook says this won’t solve anything between them and that he knows Psycho-jo wants good relations with his father. Psycho-jo stops him and tells him he proposed. Don’t ruin a good day. It wasn’t exactly the proposal or acceptance of the year, dude. Back at the park, Se-kyung tells Coach Tick that she liked Psycho-jo when he was Secretary Kim. She likes him more knowing he is the president and what’s wrong with that? Like Coach Tick said, love is an entire package. Psycho-jo has money and love. She will have them both because she wants them both. Coach Tick was wrong: love and business can mix and she will make it possible. Coach Tick doubts it and thinks that she’ll lose both. Se-kyung says her business is now to protect Psycho-jo’s love. She’ll throw away all pretenses of being a Candy-type. She won’t confess, but she will marry. She will maintain the image she needs to protect him for life. Her intentions are good, but I don’t see this going anywhere good. She asks Coach Tick for help and that she will protect her position. If Coach Tick helps and Se-kyung marries Psycho-jo, they shouldn’t ever see each other again. She doesn’t want to keep in touch with her husband’s ex. I’m really having a hard time recapping this. I’m getting this icky feeling the entire time. Why? I wanted to like this!!! Anyway, there’s a montage of everyone brooding. The montage ends with Se-kyung admitting to herself that she is completely black. In-hwa arrives to meet with Tommy Hong. She says her brother was too harsh and that things like these can happen because it involves people and people are variable. But she doesn’t understand why Psycho-jo would pick Se-kyung over a smart business move. In-hwa can’t bear not understanding and she wants him to make her understand. He glances at his tablet where the video is stored. Before he can say anything, he gets called out for an appointment and In-hwa sits to wait. She, of course, sees his papers on the table and uncovers the tablet, which has the video open. Coach Tick and Se-kyung are easily recognizable. Before she can play it, the secretary comes in to offer tea. In-hwa leaves and freaks. I foresee bad things happening. Tommy’s guest is Se-kyung, who looks really beautiful. I guess evil suits her. She hasn’t come to reply, but has come with a proposal. The marriage arrangement has ended and too many factors make it impossible. She wants him to choose between Royal Group and GN Fashion. If he solves the bad relationship between Psycho-jo and his dad, Tommy’s agreement still stands. And who better to resolve that than her? Tommy is doubtful. Psycho-jo loves her and may agree, but what about the president? She says that it’s possible with Tommy’s help. She explains that Coach Tick taught her to think like those in Cheongdam-dong and if Tommy helps her, she’ll teach him how as well. He scoffs at her, but she says it will be beneficial to him. He tells her she’s watched too many dramas. Seriously? Why does every drama pull that? In dramas the poor girl meets the rich boy, convinces the parents with her sincerity and bam! happy ending. But she’s not a good girl, so how will she do it? Does she think it’ll work? She turns the tables and asks what he thinks her ending should be. Is she supposed to be ruined for justice? Should people like them never try? That’s not for her. She wouldn’t have started this if she were going to be that way. She is no longer innocent or she would’ve confessed everything and begged for forgiveness. But she didn’t because she’s neither good nor innocent, but poor and mean. A girl like her doesn’t confess and will carry the burden her whole life and love him in her ugly way. Okay, I’m officially bored with this. He asks what will happen if she fails – she will confess. But he hasn’t failed yet, has he? She’ll give him two days to decide. Tommy goes back inside, reeling from the encounter. Meanwhile, In-hwa is preoccupied with the video she didn’t get to see. 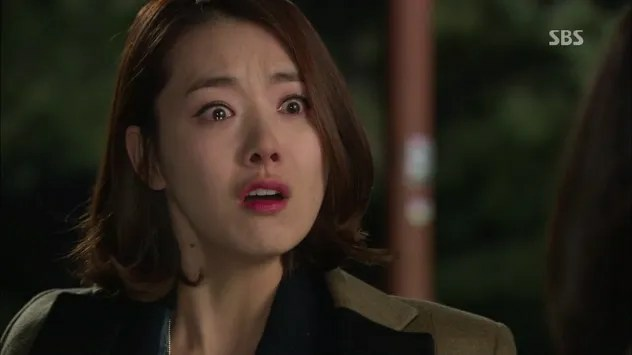 Se-kyung and Psycho-jo are planning their wedding and he wants to marry in Paris. Can I just say I’m disgusted with this match now? I don’t support her at all…or him. He’s kinda pathetic now. Anyway, he asked to be transferred to the Paris office so she can study there. She wonders if his father will attend the wedding. That silences him for a moment and then he keeps making plans for their life together. She looks disappointed. Then, she gets a text from Daddy Cha asking for a meeting. She goes to meet him and gets questioned about her parents and where she lives. Daddy Cha winces and tells her that she’ll be the one who gets hurt by this marriage. Psycho-jo is just obsessed with revenge. Se-kyung says it doesn’t matter because she knows what he’s doing. She says Daddy Cha doesn’t know or care. He gets angry and storms out. Team Mad Rabbit, minus driver Kim, is watching the video of Psycho-jo spinning Se-kyung. Ah-jung wishes they would’ve kissed and Dong-wook reveals that they already have. Everyone is all giddy over the budding romance. Se-kyung comes across them and they make kissy faces at her. She was actually looking for Dong-wook to ask about Psycho-jo and his father. They always fight even if they don’t want to. Dong-wook says Psycho-jo dreams of going to his father’s funeral because of the guilt. Although he felt suffocated by his father, he always felt guilty for letting go. Psycho-jo is afraid of approaching his father first for fear of rejection. All he wants is to be acknowledged by his father. In-hwa is having a pride fit and Tommy broods over Se-kyung’s words. Se-kyung opens a box full of her childhood drawings and goes to meet Daddy Cha. She says that Psycho-jo isn’t truly rebelling – he’s always meeting with him and near him. Daddy Cha thinks he’s trying to piss him off, but Se-kyung says that Psycho-jo just wants to be acknowledged. He wants to show his father his success and hide his failures. Se-kyung remarks that Daddy Cha has probably never complimented his son. Then she brings out her childhood works. Her father never praised her, he just collected and kept every piece of art and award throughout her life. It was enough for her to know how much her father loves her. She asks Daddy Cha to reach out to his son first. She leaves him with the drawings, which he looks through and smiles. This is my favorite storyline and the one thing I really support Se-kyung in. Daddy Cha flashes back to looking at Psycho-jo’s drawings and telling the art teacher not to tell anyone about the talents. Se-kyung leaves work to meet Tommy Hong and runs into In-hwa. She heard Se-kyung and Coach Tick were classmates. Se-kyung says they weren’t that close and still aren’t. In-hwa sends an employee to buy a tablet case and we now know she’s planning something nefarious. Did we ever doubt she would? Tommy meets Se-kyung at the restaurant where he knelt to beg someone for a chance. Now people come to beg him. He told all of them “nothing can be done.” They all looked frustrated and angry – he doesn’t see that in her eyes anymore. Rather, he sees desire again. He’s seen desire turn into frustration and anger and thought he was the only one who managed to turn it back to desire. He asks her if she has the confidence to never confess and be the lady of the Royal Group’s household instead of the Artemis household. Tommy makes her promise that the day she becomes part of Royal Group’s household is the day she’ll give him wings. 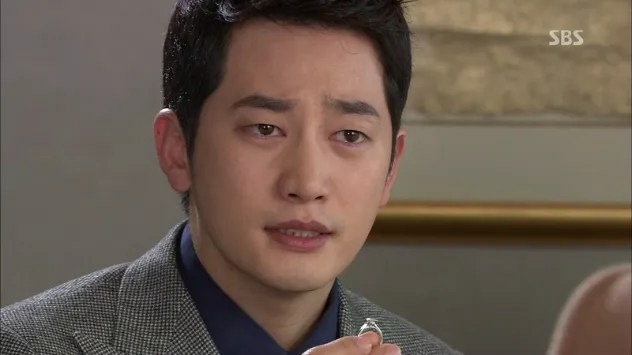 His secretary is surprised he accepted Se-kyung’s proposal. He’s not sure why he did, but he is sure he had to accept it to look good. Great, she’s siding with his slimy, smirky self. Gross. He meets In-hwa who orders someone to come into the meeting after five minutes. When they go up, his secretary says a package is being delivered that he needs to sign for in person. In-hwa takes the opportunity to switch his tablet for hers, which has a matching cover. She runs to the bathroom and nervously searches for the video and downloads it. Then she returns to the office and barely manages to make the switch back before Tommy returns. In-hwa asks again about Se-kyung. He says the reason for the whole thing was because of Psycho-jo who isn’t cut out for a marriage of convenience. He apologizes for not having the confidence to tell her. 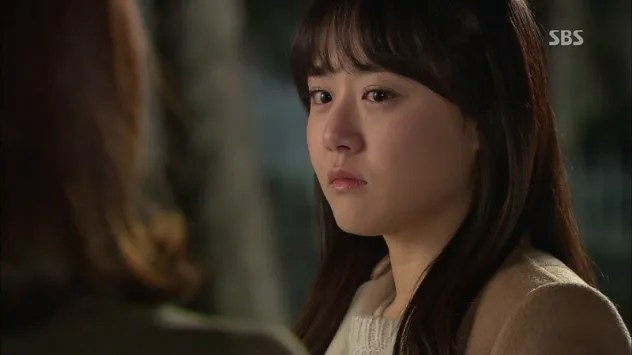 Psycho-jo goes to Se-kyung’s family to ask for their permission. They are understandably shocked. Everything has been planned and the desire for marriage is mutual. But dad surprises them all by refuses to give them permission. He knows Psycho-jo is a good guy, but his daughter has had a hard time because of him. He hoped that they’d date and break up. Dad’s afraid of the social status difference. They aren’t the type to marry just for money. Dad wants his daughter to live with and be loved by a normal family, not with a man who has cut relations with his father. This gives Psycho-jo pause. Psycho-jo doesn’t understand why dad just can’t accept him and Se-kyung thinks Psycho-jo is envious of her family. He is. She wants him to do as she says: take the initiative and go see his father. He pouts that he doesn’t want to and she wonders why he won’t do what she asks. It’s the first request she’s made of him. He blusters a bit and she shows him an article about his grandfather’s memorial. She doesn’t want a man who won’t go to his grandfather’s memorial rites. He asks her not to scold him, even if everyone else does. He rests his head on her shoulder and she comforts him. They share a cute moment, but I can’t enjoy it. Psycho-jo goes home and pulls out a picture of him and his father when he was a child. 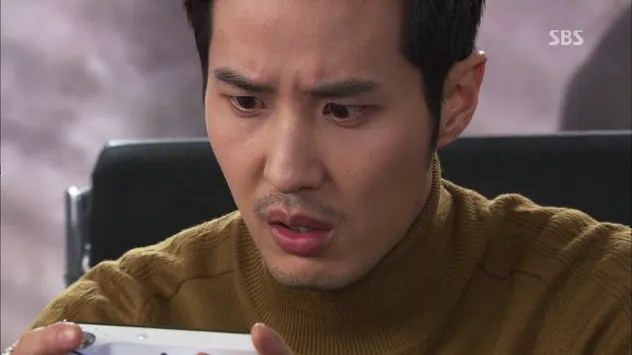 He receives a text from Se-kyung with a picture of a sad rabbit. Psycho-jo smiles and sends a video of the happy rabbit walking around. She runs to meet him and Psycho-jo attends the memorial rites. Daddy Cha is shocked to see him and everyone else is super happy. Father and son perform the ceremony awkwardly together. When Psycho-jo goes to leave, dad says he should taste the memorial food before leaving. Psycho-jo goes back to the car where Se-kyung waits. she is proud of him for going and raises her hand for a high-five. He denies her and she urges him to do it. She pouts when he refuses to high-five her and they high-five. Meanwhile, In-hwa is watching the video in abject, teary horror. Oh, the overacting! Coach Tick comes in and In-hwa is super cold to her because she knows both Coach Tick and Se-kyung are gold diggers. Psycho-jo and Se-kyung share a cute moment as the storm brews. I don’t know if I can handle this show. I seriously don’t want to watch the rest of it. I’m not even curious about how it will turn out. I’m NOT rooting for the heroine or for the OTP. I want them to break up. The only pairing I’m rooting for is father and son. Mostly it’s Se-kyung’s development. She’s just so squiggly and confusing as a character. I’m actually looking forward to In-hwa’s intervention just for some conflict derived from a non-stupid internal source. Okay, forcing myself to watch episode 12 now. Cheongdam-dong Alice Episode 11 Screencaps.